By rolling back the Lifeline program, you will be eliminating affordable phone and internet-access options for millions of poor people. Low-income families, the elderly, people with disabilities, people living on tribal lands, veterans, people of color and unhoused people all need Lifeline. There's no reason to move forward with such a cruel and heartless plan. Please leave the FCC’s Lifeline program alone. What does Lifeline mean to you? The FCC has voted along party lines to move forward with its plan to dismantle the Lifeline program. The proposed rollback would rob poor people of affordable phone and internet access and disproportionately impact people of color, seniors, veterans and people with disabilities. In moving forward with this heartless proposal, the FCC ignored bipartisan objections from Senate and House leaders who have heard from concerned constituents that this plan would make it difficult for them to search for jobs, advance their education, meet their basic needs and stay informed. 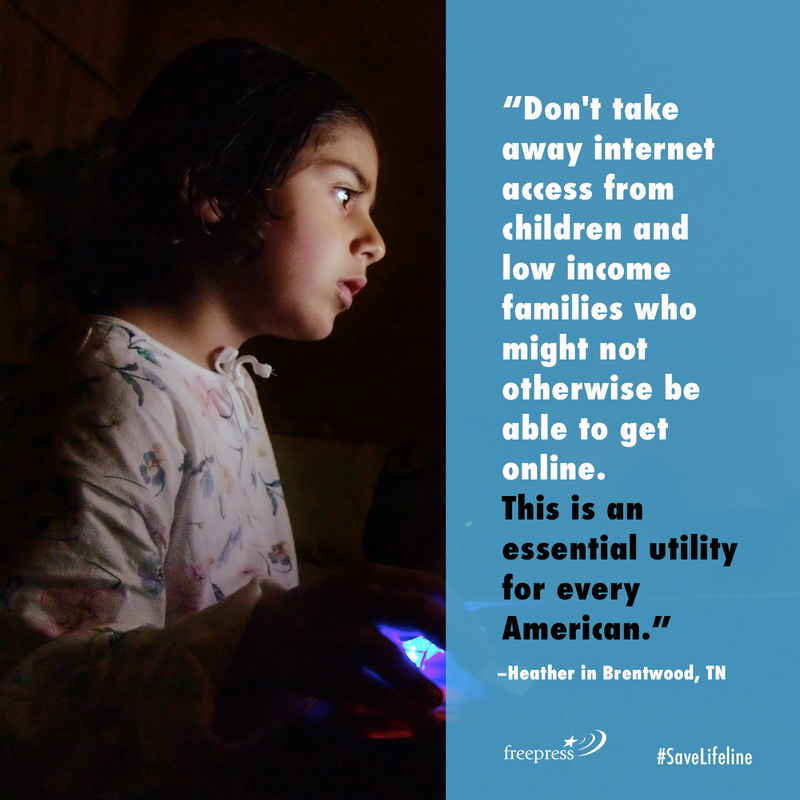 The Lifeline program provides a modest $9.25 monthly subsidy to most recipients so that millions of poor people can connect to communications services. Yet the FCC’s Republican leadership is doing all it can to jeopardize this program. FCC Chairman Ajit Pai’s plan would implement a budget cap on Lifeline — which would arbitrarily limit program participation or slash funding to fully eligible recipients. Pai is also floating the possibility of a lifetime benefits cap that would cut off funding for the most vulnerable users, like elderly people and people with disabilities, by limiting the amount of time an individual can use the program. And these cuts are just the tip of the iceberg. Pai’s most sweeping proposal would kick wireless resellers — who provide access to over 70 percent of Lifeline recipients — out of the program. This move would eject over 7 million Lifeline subscribers from the program and leave large swaths of the United States without any Lifeline options. For many low-income families, this means they’ll either have zero Lifeline options, or only their local wired phone company’s expensive service to choose from. No one is asking for this cruel rollback. And the FCC majority is rationalizing its attack with vague rhetoric about program abuse and fraud. The plan to gut Lifeline has drawn objections from Native American tribal leaders, poor people, single moms, unhoused people, people of color, elderly people, victims of natural disasters, veterans and people with disabilities, all of whom would be disproportionately harmed by this extreme proposal. When he was confirmed as FCC chairman, Ajit Pai claimed that bridging the digital divide would be a top priority of his administration. Gutting Lifeline would do the exact opposite, leaving more low-income people without access to vital communications services. We can’t let this happen: Tell the FCC to drop its plan and leave Lifeline alone.